Hailey's Hope Foundation | World Prematurity Day–A Mother’s Reflection! November 15, 2013 by Jennifer Degl. My relationship with prematurity can be likened to a terrible nightmare that suddenly turns out to be a dream come true. In May of 2012, I delivered a 1 pound 4 ounce little girl at 23 weeks into my pregnancy. She was just 11 3/4 inches long. My daughter, who we named Joy, was born premature as a result of my 100% placenta previa. I was in and out of the hospital from 17 weeks gestation until her delivery, as a result of my fourth episode of extreme hemorrhaging. I almost lost my baby and my own life on four different occasions during my pregnancy. My pregnancy with Joy was not at all what I had experienced with my previous pregnancies resulting in three full-term healthy boys. 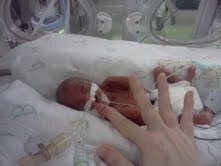 Joy was considered a micro preemie (a baby delivered before 26 weeks). Any delivery before 37 weeks is considered premature. The March of Dimes (rightfully so in my opinion) is now advocating that elective deliveries not be performed before 39 weeks to allow for full brain and lung development. 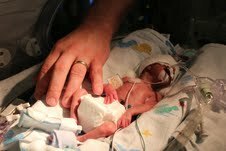 As parents of preemies, we may have taken very different roads to the NICU, but we all arrived with bumps and bruises. There is nothing normal about delivering a baby and then returning home without it. There is nothing normal about not being able to hold your baby for weeks or months. There is nothing normal about the hours spent pumping breast milk and then watching it drip down a feeding tube into your baby’s mouth or nose and not participating in the feeding at all. After my delivery, I could not see my daughter for two days, due to complications from my surgery. When I was finally wheeled in to see her, I was shocked! She did not look like my other children did as newborns. Micro preemies look like tiny little aliens with transparent skin. They have numerous tubes and wires attached to them while a ventilator initiates each breath. Parents are lucky if they can stick their fingers into a hole in their isolette (incubator) while hoping their baby will wrap his or her fingers around theirs for just a minute. Visits and bathroom breaks are planned around vital sign checks and diaper changes in hopes that they will catch a glimpse of their baby without goggles covering their eyes. And every goodbye is feared to be the last. According to the World Health Organization, an estimated 15 million babies are born premature each year. About 1 million babies die annually from preterm birth complications. Across 184 countries, the rate of preterm birth ranges from 5% to 18% of babies born. The March of Dimes says that each premature birth costs around twelve times as much as each full-term healthy birth, resulting in the United States spending about $26 billion a year on prematurity. While the money spent on prematurity may surprise you, the long term health effects often felt by these premature babies will terrify you. A premature birth may lead to many complications such as cerebral palsy, impaired cognitive skills, vision problems, hearing problems, severe breathing problems, behavioral problems, and overall chronic health issues. My micro preemie is now 18 months old and I am watching her sleep on the monitor screen as I write this. She is almost walking. I expect her to master it within a week or two. Joy loves to play with her three older brothers and enjoys eating anything put in front of her. She says a handful of words and loves to play with legos, blocks and be read to. Her only major impediment from being born 17 weeks early is a lung disorder called BPD (bronchopulmonary dysplasia). Because of this, any ordinary respiratory virus can end up turning into pneumonia due to scarring on her lungs. Other than that, she is just like any full-term baby. You would never be able to tell that she had such a difficult beginning by looking at her. We are so blessed that Joy is in our lives. For World Prematurity Day, please take a moment to honor those babies who were born premature and the memory of those who lost their battle with prematurity and help spread awareness of the causes, signs and complications from premature birth.